I love wraps. Subway has GREAT wraps! They use this really thin, pliable, tasty tortilla that I just love. They are so chewy and delicious. This is a good stand-by when you’re in a rush and need a quick dinner. Wraps are so fun! You can put just about anything in them, just like omelets. Heck, you could even throw your leftover omelet in there. I always try to keep tortillas in the house. Sometimes I make them, and sometimes I buy them. It’s really easy to make your own. But for the sake of time, I used these tortillas from Kroger. Did you know even McDonald’s is trying to get in on the wrap thing? Big Mac Wrap? Seriously……stick with the Big Mac. Why mess with perfection? Oh, and if you didn’t know – the coffee at McDonald’s is hot. Really hot. 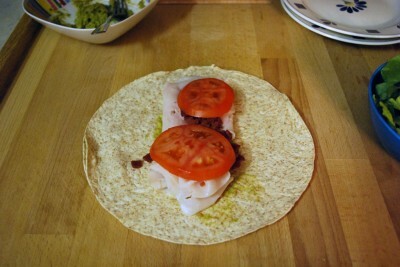 All you need is tortillas, lettuce, chili sauce, sliced turkey, bacon bits, tomato, and avocado. If you don’t have chili sauce, you can substitute taco sauce. You could even use salsa in a pinch. I’m always using salsa for substitutions. You can use whatever type of tortillas you want, just make sure that they’re the big ones (for burritos). If you buy the little ones, you won’t be able to roll them up as well……and really, if you’re going to eat a tortilla, why not do it right? Now we’re going to make a guacamole sauce. You can go HERE to read about making homemade guacamole. That post will also tell you how to get the pit out of your avocado. See the garlic salt? It’s there because I can’t remember things and I forgot to add it to the picture. I have Momnesia. Mush up your avocado and add the chili sauce and garlic salt. Mix it up and we’re ready to roll! Ha, ha! Ready to roll……get it?Warm your tortillas up a bit. Why? Because if you don’t, they won’t roll up; they’ll just crack. Say no to crack. 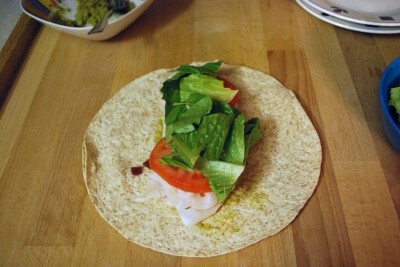 Spread a thin layer of the avocado stuff on there, right in the middle. Warm your tortillas up a bit. Why? Because if you don’t, they won’t roll up; they’ll just crack. Say no to crack. 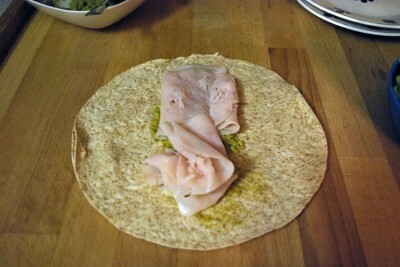 Spread a thin layer of the avocado stuff on there, right in the middle. Now lay some turkey on top. If you have leftover turkey from another meal, you can use that………or chicken. It doesn’t have to be turkey. We just like turkey in my house. Now, don’t judge me but I used bacon bits I purchased. Yes, I realize that I could have fried my own bacon and made my own bacon bits…….but here’s the truth. I forgot to get the bacon out of the freezer. And then I just didn’t feel like frying up a pan of bacon. I was tired. I had cooked all day. So, processed delicious bacon bits it was! And in my defense, I did use the REAL ones. However, I do like the fake ones too. Barry says he likes those best. Next we need to layer on some tomatoes. Once again, you could substitute salsa if you don’t have tomatoes on hand. I had just been to the produce market, so that’s why I had some. And let’s face it – tomatoes aren’t that great in the winter. I’m just here to state the obvious. I piled on the lettuce. Barry loves lettuce. I think he might be part rabbit. You could leave the lettuce out if eating it is against your child’s religion. 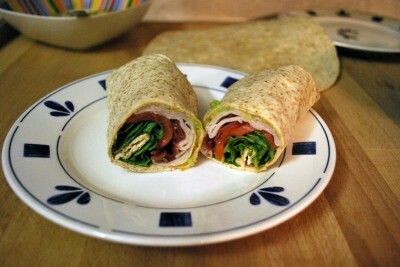 Okay, stand back and let’s learn how to fold up a wrap. 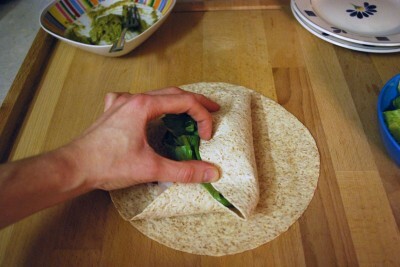 First, you fold in the top and bottom part of the tortilla and hold it with your hand like so. I am NOT a hand model. Now, bring one side over toward the middle and hold it there too. Right about now it got a little difficult trying to fold this up and take pictures at the same time. I really need to learn how to use my tripod and timer. 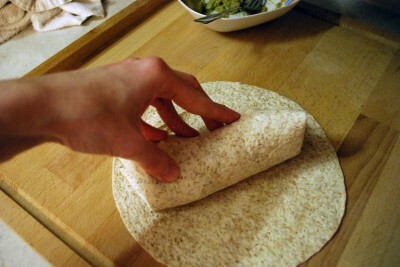 Holding over the side you just brought in, roll up the tortilla toward the side that’s still open. Viola! You made a wrap! It’s a wrap. Ha, ha! I’m sorry. I love commonly-used phrases. If you want to get all professional, just take a serrated knife and half the wrap so that you can see all the pretty insides. Delicious! 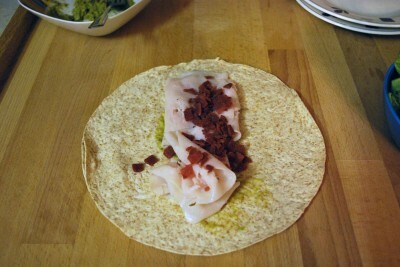 The bacon really does something special in this wrap. But seriously, when doesn’t bacon do something special? Just the word bacon makes me drool. Quick and easy and your family is tickled pink. Bacon. 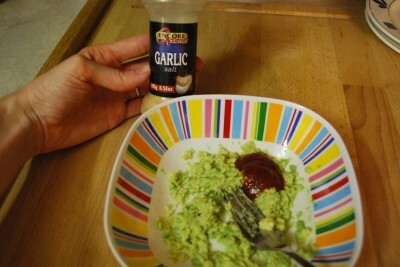 In a small bowl, mix avocado, chili sauce, and garlic salt. 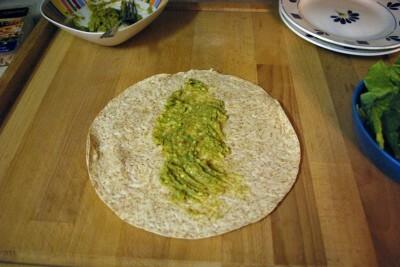 Spread about one tablespoon of avocado mixture on each tortilla. 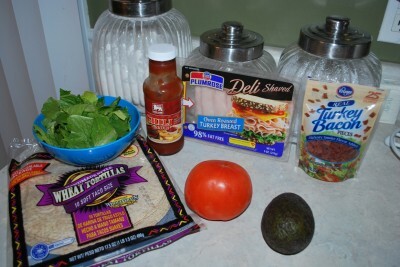 Top tortillas with turkey, bacon, lettuce, and tomato. 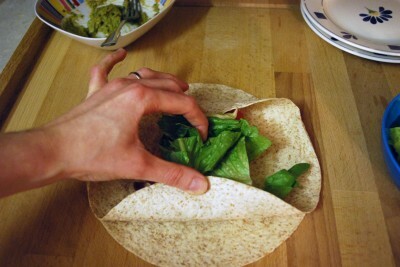 Fold in sides of each wrap; roll up. Cut each in half. Serve immediately or refrigerate up to 24 hours.